The practice of firing gun salutes has existed for centuries. Early warriors demonstrated their peaceful intentions by placing their weapons in a position that rendered them ineffective. This custom was universal, with the specific act varying with time and place, depending on the weapons being used. The tradition of rendering a salute by cannon originated in the 14th century as firearms and cannons came into use. Since these early devices contained only one projectile, discharging them once rendered them ineffective. Originally warships fired seven-gun salutes; seven planets had been identified and the phases of the moon changed every seven days. Land batteries, having a greater supply of gunpowder, were able to fire three guns for every shot fired afloat, hence the salute by shore batteries was 21 guns. The multiple of three probably was chosen because of the mystical significance of the number three in many ancient civilizations. Early gunpowder, composed mainly of sodium nitrate, spoiled easily at sea but could be kept cooler and drier inland magazines. When potassium nitrate improved the quality of gunpowder, ships at sea adopted the salute of 21 guns. For many years, the number of guns fired for various purposes differed from country to country. By 1730, the Royal Navy was prescribing 21 guns for certain anniversary dates, although this was not mandatory as a salute to the Royal family until later in the eighteenth century. Several famous incidents involving gun salutes took place during the American Revolution. On November 16, 1776, the Continental Navy brigantine Andrew Doria, Captain Isaiah Robinson, fired a salute of 13 guns upon entering the harbor of St. Eustatius in the West Indies (some accounts give 11 as the number). A few minutes later, the salute was returned by 9 (or 11) guns by order of the Dutch governor of the island. At the time, a 13 gun salute would have represented the 13 newly-formed United States; the customary salute rendered to a republic at that time was 9 guns. This has been called the "first salute" to the American flag. About three weeks before, however, an American schooner had had her colors saluted at the Danish island of St. Croix. The flag flown by the Andrew Doria and the unnamed American schooner in 1776 was not the Stars and Stripes, which had not yet been adopted. Rather, it was the Grand Union flag, consisting of 13 alternating red and white stripes with the British Jack in the union. The first official salute by a foreign nation to the Stars and Stripes took place on February 14, 1778, when the Continental Navy ship Ranger, Captain John Paul Jones, fired 13 guns and received nine in return from the French fleet anchored in Quiberon Bay. 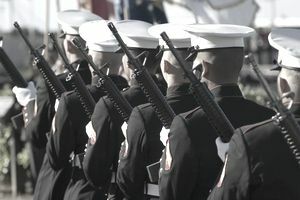 The 21-gun salute became the highest honor a nation could render. Varying customs among the maritime powers led to confusion in saluting and return of salutes. Great Britain, the world's preeminent sea power in the 18th and 19th centuries, compelled weaker nations to salute first, and for a time monarchies received more guns than did republics. The gun salute system of the United States has changed considerably over the years. In 1810, the "national salute" was defined by the War Department as equal to the number of states in the Union--at that time 17. This salute was fired by all U.S. military installations at 1 p.m. (later at noon) on Independence Day. The President also received a salute equal to the number of states whenever he visited a military installation. The U.S. Navy regulations for 1818 were the first to prescribe a specific manner for rendering gun salutes (although gun salutes were in use before the regulations were written down). Those regulations required that "When the President shall visit a ship of the United States' Navy, he is to be saluted with 21 guns." It may be noted that 21 was the number of states in the Union at that time. For a time thereafter, it became customary to offer a salute of one gun for each state in the Union, although in practice there was a great deal of variation in the number of guns actually used in a salute. A 21-gun salute for the President and heads of state, Washington's Birthday, and the Fourth of July became the standard in the United States Navy with the issuance of new regulations in 1842. Today, the national salute of 21 guns is fired in honor of a national flag, the sovereign or chief of state of a foreign nation, a member of a reigning royal family, and the President, ex-President, and President-elect of the United States. It is also fired at noon of the day of the funeral of a President, ex-President, or President-elect, on Washington's Birthday, Presidents Day, and the Fourth of July. On Memorial Day, a salute of 21-minute guns is fired at noon while the flag is flown at half-mast. Fifty guns are also fired on all military installations equipped to do so at the close of the day of the funeral of a President, ex-President, or President-elect. At military funerals, one often sees three volleys of shots fired in honor of the deceased veteran. It is often mistaken by the laymen as a 21-gun salute, although it is different. In the military, a "gun" is a large-caliber weapon. The three volleys are fired from "rifles," not "guns." Anyone who is entitled to a military funeral will receive the three rifle volleys, subject to availability of honor guard teams. The firing team can consist of any number, but one usually sees a team of eight, with a noncommissioned officer in charge of the firing detail. Whether the team consists of three or eight, or ten, each member fires three times (three volleys). The three volleys come from an old battlefield custom. The two warring sides would cease hostilities to clear their dead from the battlefield, and the firing of three volleys meant that the dead had been properly cared for and the side was ready to resume the battle. The flag detail often slips three shell casings into the folded flag before presenting the flag to the family. Each casing represents one volley.